I get a lump in my throat and a tear in my eye each time I read about each good boy who’s passed on because my dog, Gracie, is 14 now and I’m not sure she’ll make it to 15. Lately, she’s been troubled by almost constant anxiety and seems to be suffering from the early signs of canine dementia. This is a part of getting older that I didn’t expect. Every time I visit Facebook, it seems, one more person is posting a tearful tribute to her dog who just passed over the rainbow bridge. It makes sense that this is happening to us all now. So many of us got pets for the household when our kids were young. 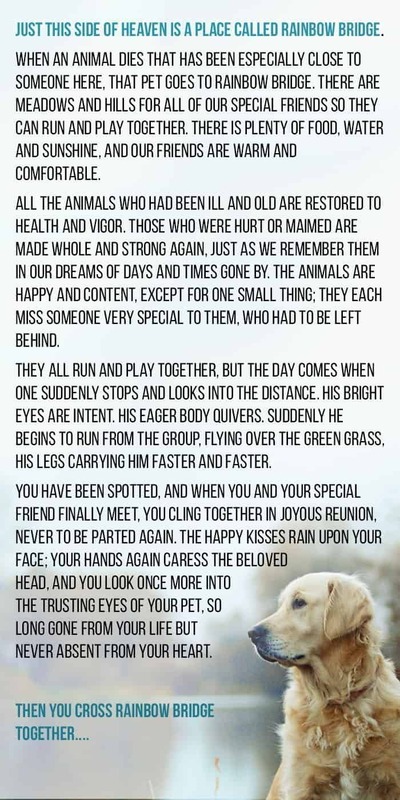 Now, those kids are growing up and leaving home and the pets they left behind are getting old and dying. It’s enough to break almost any parent’s heart. Gracie started showing her age almost two years ago when she suddenly became terrified of thunderstorms. I spent more than one night sleeping beside her on the floor of our bathroom as she paced the floor, soothed only when I held her tightly, acting as a human thundershirt. Then she became incontinent. When she started having problems, I’m ashamed to say that misinterpreted the issue and then handled it exactly wrong. When she started urinating (copiously!) on the furniture and on our bed, I attributed it to her jealousy over our new dog and responded by instituting an off the furniture policy and confining them both to the upstairs hallway when we went out. It wasn’t until she started urinating while she slept on her dog bed that it occurred to me that she might be having a problem and took her to the vet. She was, of course. Like so many of us women in middle age, Gracie suffers from the side effects of low estrogen, quite common in dogs who have been spayed. The vet finally settled her on Diethylstilbestrol (DES), a form of estrogen that used to be given to pregnant women but was taken off the market (for good reasons). So now both Gracie and I are on hormone therapy. We had settled into a new normal with Gracie. We started every morning with her medication routine: PPA for the incontinence, Apoquel for Allergies, and DES once a week to help with the break-through incontinence. Then Gracie started pacing. Gracie walks around every day now in a near-constant state of anxiety. She paces around the house for hours, stopping only to stare at the walls for minutes at a time. We’ve had to take up all our rugs because she’ll scrape any soft object she can find into a nest and then urinates on it. Now that the rugs are gone, she’s tried to do this with my leather briefcase, my other dog’s chew toys, and my husband’s sneakers. She doesn’t really sleep during the day any longer so she heads up to her crate, exhausted, at 7 p.m. to finally get some sleep. She cries when she wakes up until we take her out and then she starts the pacing again. Urinating or defecating inside the house. Pacing or increased anxiety. This a thousand times. Starting into space or at walls. I’m ashamed to say that we laughed when we first saw Gracie doing this. She’ll frequently stand for minutes at a time just staring into space. It’s like she’s tired and wants to go to sleep but doesn’t remember how to lay down. Now that I know why she’s doing it, it breaks my heart, of course. Doesn’t respond to the family. We’ve had an ongoing discussion for a while to determine whether Gracie can’t hear any longer or just simply doesn’t respond to us. I just dropped a pencil on the floor and Gracie jumped so I’m inclined to think that she sometimes simply no longer responds. This heartbreaking video shows many of the signs that dogs with dementia can exhibit. I’ve seen Gracie do several of these, including getting stuck and circling. 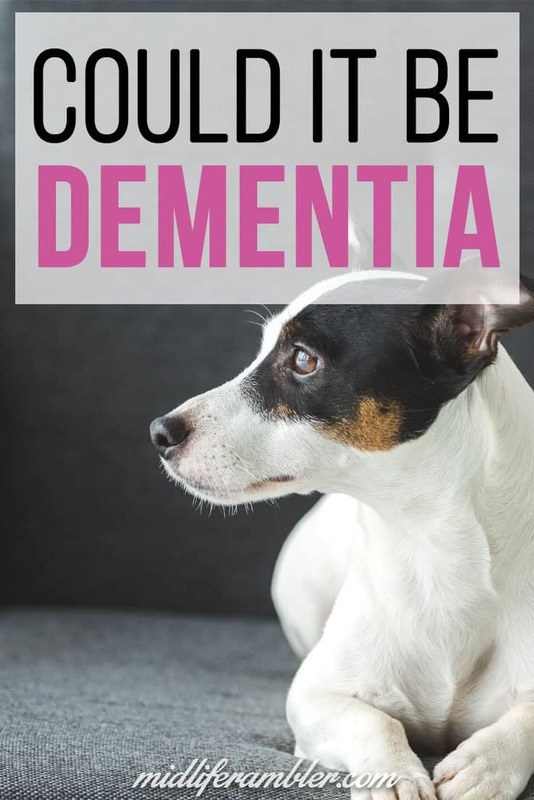 So many people think the symptoms of canine dementia are just a normal part of aging. But it’s important to mention any new behaviors to your vet because there are some treatments. 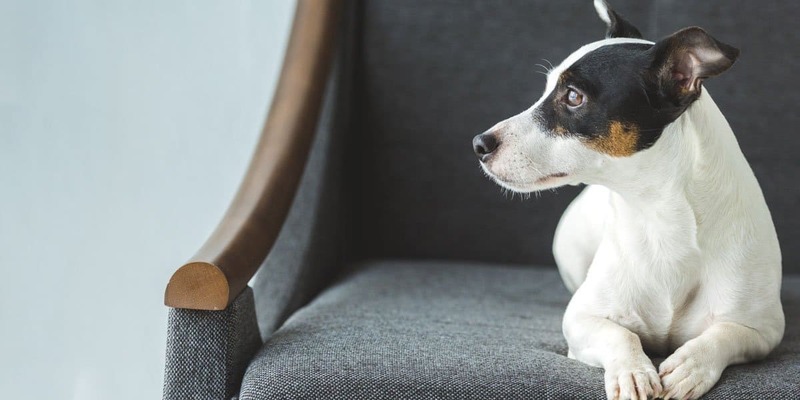 Some dogs respond well to a medication called Anipryl, which helps increase dopamine activity in dogs, making them more alert and responsive. 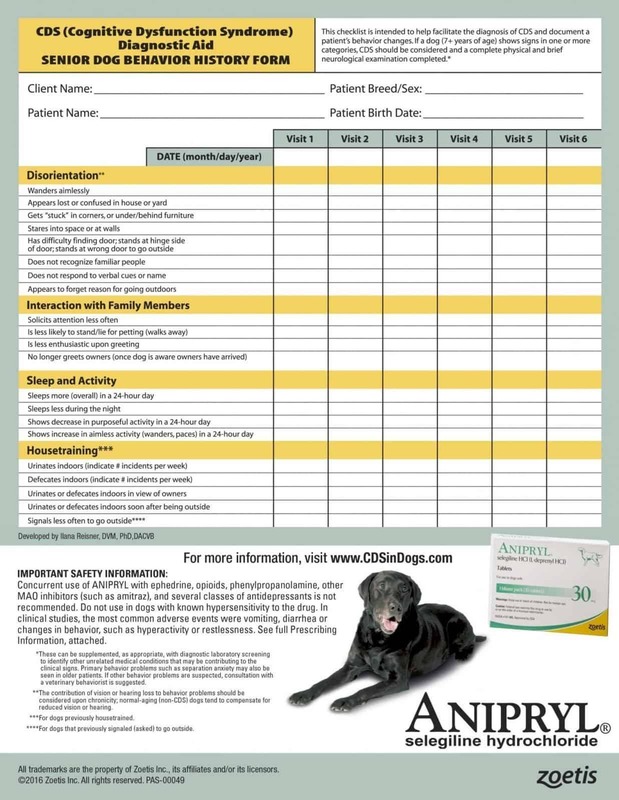 The Aniprl website also has a helpful checklist to share with your vet so he or she can determine if your dog’s issues are caused by dementia. I have tried these CBD chews when we need to put Gracie in the crate while we’re gone during the day and they seem to help her relax and sleep until we get back. These chews have been flat-out amazing for my dog Lemmi who tends to get so over-excited that she’ll frequently hurt the person or animal that she’s trying to love. One of these days each day helps her keep calm during her interactions with others. I’m still working with my vet to determine the exact cause and best treatment for Gracie’s recent issues. In the meantime, I’ve found a few things that seem to be helping Gracie during this time. 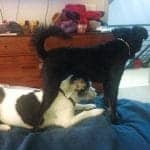 Dog Massage. 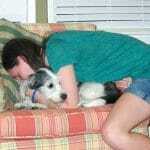 Even in her prime, Gracie was never what anyone would call a loving dog. Her idea of good quality time together was sitting in the room with me but in a chair all the way on the other side of the room. But she appreciates it now when I sit down beside and give her a few minutes of dog massage. It helps her relax and feel safe for a little while at least. Giving Gracie a Safe Space. Sometimes it seems that the only way that Gracie can settle down is if I give her what she wants: a soft fluffy rug she can pee on. If I can’t settle her down any other way, I’ll take the bed out of her crate, lay down a soft fluffy rug that I keep for just this purpose and let her go crazy. Eventually, she’ll calm down and I’ll let her out and clean up her crate. I still love my sweet, little neurotic dog who feels that sitting in the same room with me is enough affection, thank you very much, and who absolutely knows the camera is stealing her soul. The thought that our time together might be coming to an end soon breaks my heart. So I was heartened to learn that dogs with canine dementia frequently live as long as dogs without dementia. However, the average life-span of a terrier is approximately 15 and, as Gracie is 14 now, it seems that our time together will be short. 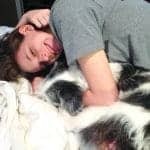 Additionally, most dog owners, including myself, don’t notice their pet’s dementia until it’s progressed from mild to moderate or even severe. At that point, the best care is simply making sure your pet is as comfortable as they can be. I don’t have a dog but I did have a cat that I had to put to sleep. Those were difficult days. Thanks for you post — maybe having an aging animal is a good way to see the path for an aging mother or father. We all need to get on board for our own aging too. Life is a process and every part of it has its joys and sorrows. That’s so true Beth. I think it’s so hard to see them age because it’s a reminder that we’re also growing older. Oh gosh. This brought me to tears. Our old man dog is going through some similar things. The anxiety is intense, no licking, but loads of crying. It breaks my heart. I hope Gracie is doing well w. her new meds and stays strong! Give her a squeeze from me. I don’t have a dog or cat but many of my friends do, and a lot of these pets are aging. I am a caregiver for an elderly in law in her late 80s…can so identify. 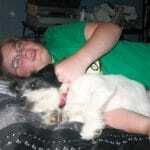 God bless you…that little dog will be missed I am sure when she is gone. But until then you are a very good dog owner. Give Gracie my best. First of all, I love your title SO much. 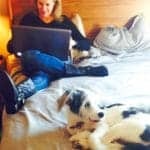 Our pets are our fur children and such important members of the family. 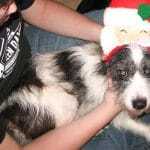 We are in the same phase you are with our sweet 12 YO Duncan and it is just heartbreaking. Dogs don’t live nearly long enough. It is so sad isn’t it? It isn’t even the “she’s going to die” thing, it’s just heartbreaking to see her so feeble.